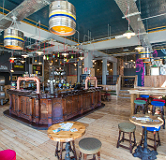 The new look Temple Bar houses a young and vibrant crowd who know their drink, love their food and demand good music. There’s a discerning yet warm atmosphere in this contemporary drinking den where you can simply step off the street to enjoy Firebird ‘brewery fresh’ Bohemia Pilsner served straight from the brew tanks. The award winning Curry Leaf Café serves up a slice of Indian street food that perfectly complements the huge selection of real ale and craft beers that fill this island bar.